Hello all– I’m up in San Francisco visiting kids this week and Larry stayed home this time to work with a house project going on. (thanks Larry!) 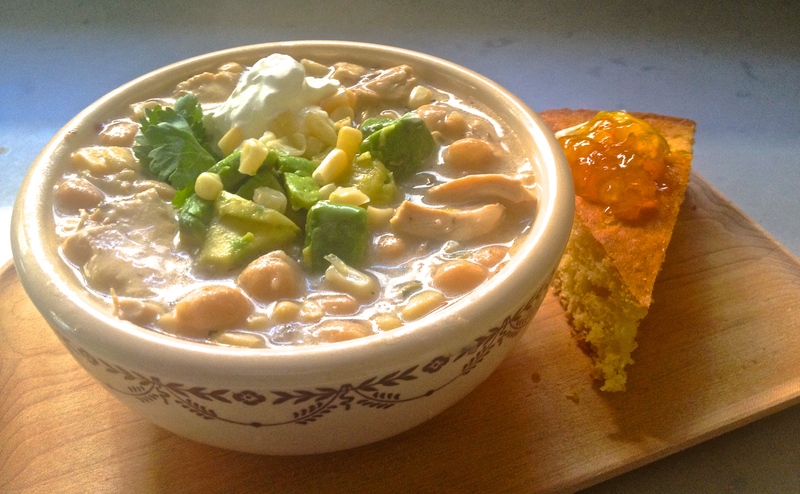 So I made up a big pot of soup with some of his favorite ingredients — beans, barley and Swiss chard (the last sign of life in our vegetable garden). It should keep him happily fed for a few meals! Heat the oil in your soup pot and then throw in the chopped onion. Cook for 3 or 4 minutes, add the garlic, salt & pepper and cook a minute more. Pour in the broth and tomatoes. Bring the mixture to a boil and then add in the barely. Lower to a simmer and cook 30 minutes, until the barely is tender. Add the chopped chard and rinsed beans and cook 4 or 4 minutes more to warm it all up. Stir in the parmesan an serve with a dash of sour cream or a sprinkle of parmesan on top (or both!). *I used chicken broth because that’s what I had in the cupboard. **I have marjoram growing like weeds in my side yard, so dropped a piece on top. Around here we love a tableful of antipasto– savory little plates to launch into the meal. But on weekday evenings, there’s not too many leisurely multi course dinners at our house! 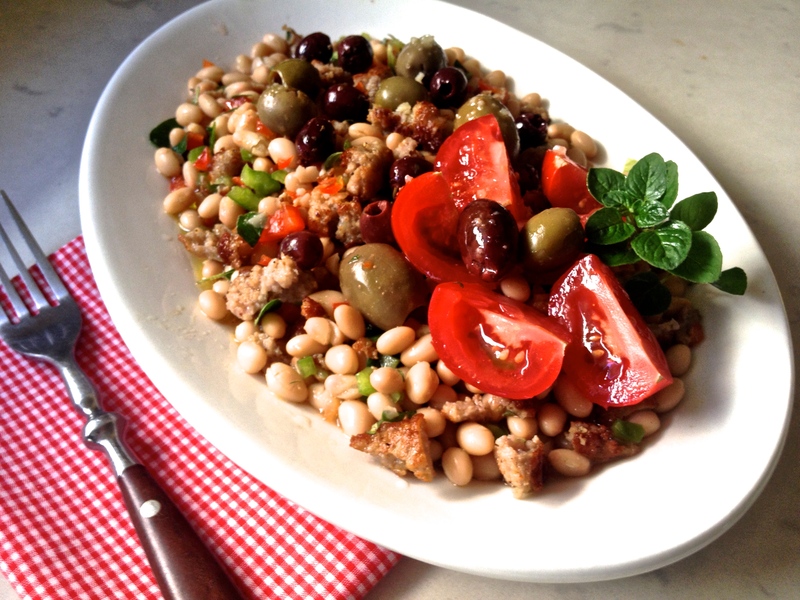 So this dish rolls the antipasto and pasta all into one meatless plateful. And it’s lovely that the whole things can be put together in about 20 minutes. Put the water on to boil for the pasta. Salt it liberally. Heat the olive oil in a large pan and drop in the chopped onion. Stir and let it cook 3 or 4 minutes until it starts to brown. Add the garlic and mushrooms and cook 1 minute more. Then pour in the tomatoes (including the juices in the can). Rinse and drain the white beans and add them in too. Simmer on low for 5 minutes or so until the pasta is cooked. Drain the pasta and spread it on a pretty platter. Mix the feta and olives into the sauce at the last minute and then pour it all over the pasta. Eat it hot! Delicious! 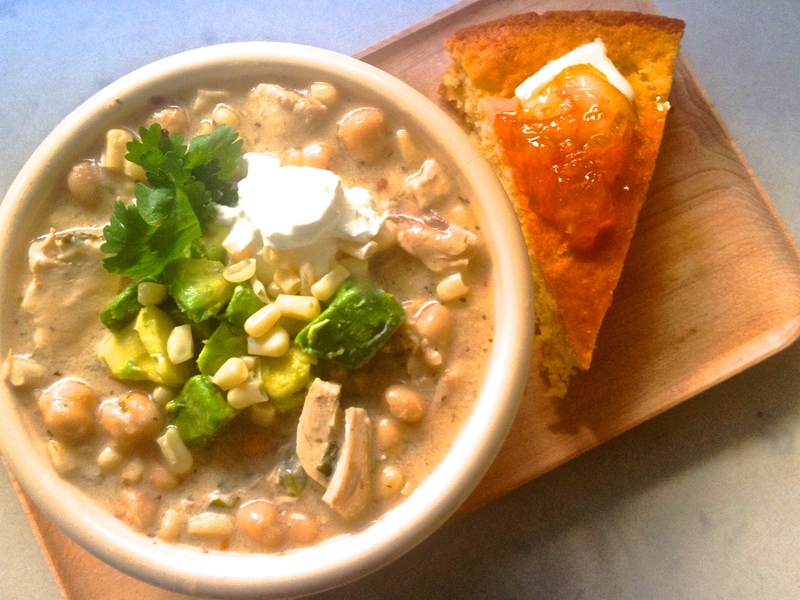 Hi friends– here’s a steamy chunky soup that I had for dinner last weekend and leftovers for lunch all week. That’s a big pot of soup! With a sturdy loaf of bread and a bright salad slathered with balsamic vinegar, you can pretend you’re eating in an Italian village (or just sitting in the teacher’s lunchroom at school). Meanwhile, in your soup pot, heat the olive oil. Then crumble and cook the Italian sausage til it’s well browned. Remove the cooked sausage from the pot and drop in the onions and carrots. Cook 3 minutes, until they soften a bit and add in the garlic. Next stir in the chicken broth, tomatoes, water and basil. Cook at a simmer for 10 minutes. Then add in the white beans, pasta and roasted pepper and cook just a couple minutes more to heat it all through. Serve it up hot with a sprinkle of grated parmesan and some shredded basil or marjoram. *The recipe I worked from called for digitali pasta– but I used the smaller version, macaroni salad pasta because I had it in the cupboard. **I used marjoram, because it grows like a week in the side yard. 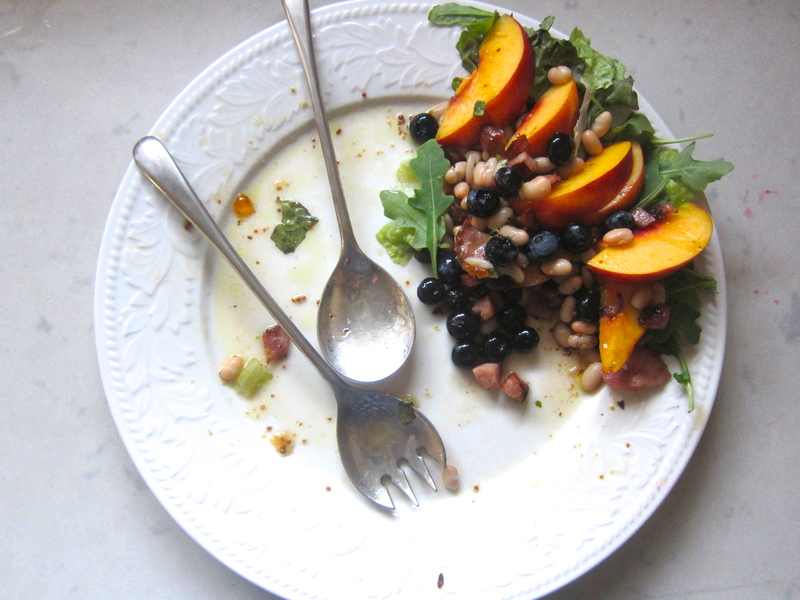 Hello there– It’s summer and if you want a fast, cool, savory summer meal, here it is. Just a few ingredients and a bit a cooking and chopping and it’s on the table– I like to make it ahead and cool it in the fridge. Serve it up with a chunk of sturdy bread to dredge up the dressing on the bottom of the plate and it’s dinner. Rinse the beans in a sieve and shake dry. To make the dressing, combine the olive oil, vinegar, garlic and salt & pepper in a small container with a tight fitting lid. Shake it enthusiastically until it’s thoroughly blended. 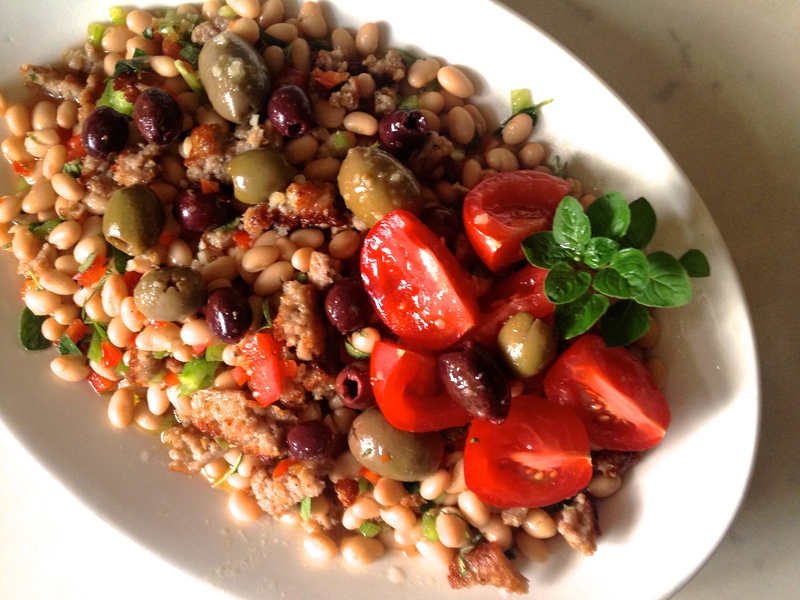 Then combine the beans, sausage, red & green pepper, basil and olives. Toss this with the dressing and spread it on a nice platter. Top with the cut tomatoes. That’s it! So easy. Hello all– There’s not usually bacon hanging around in our fridge. But when the kids are coming home for a visit, I head straight for the market and get all the things they like to eat. Including bacon. Lots of it. So now they’ve come and gone for Christmas/New Years. And there’s still a bit of bacon lingering in our kitchen. 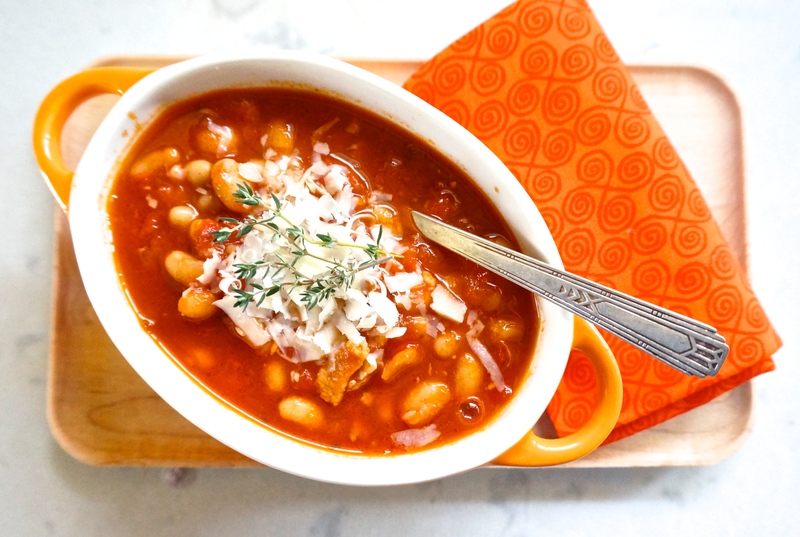 What better to do with it, than a big pot of white bean & bacon tomato soup? 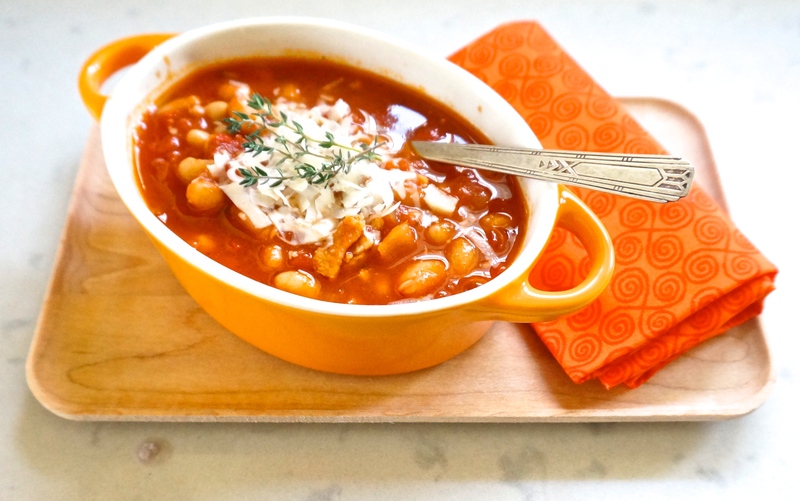 It’s one of those warm & cozy soups– sweet little beans, salty bacon and all that rich tomato holding it all together. With a slab of brown bread and a crunchy salad, it’s dinner. Cook the cut bacon in a soup pot until lightly browned. Remove the bacon. Pour out all but 3 tab. of the bacon fat from the pot. Add the cut onions to the pot. When they are lightly browned, add in the garlic, thyme, bay leaves, salt and pepper. Cook a minute more. Then add in the crushed tomatoes, petit cut tomatoes, chicken broth and cannellini beans. Simmer the soup for 15 minutes. Serve it up hot topped with grated parmesan romano cheese and a sprig of thyme just to make it pretty. Drop the ham bits into a hot pan with the olive oil and cook until they crisp around the edges. 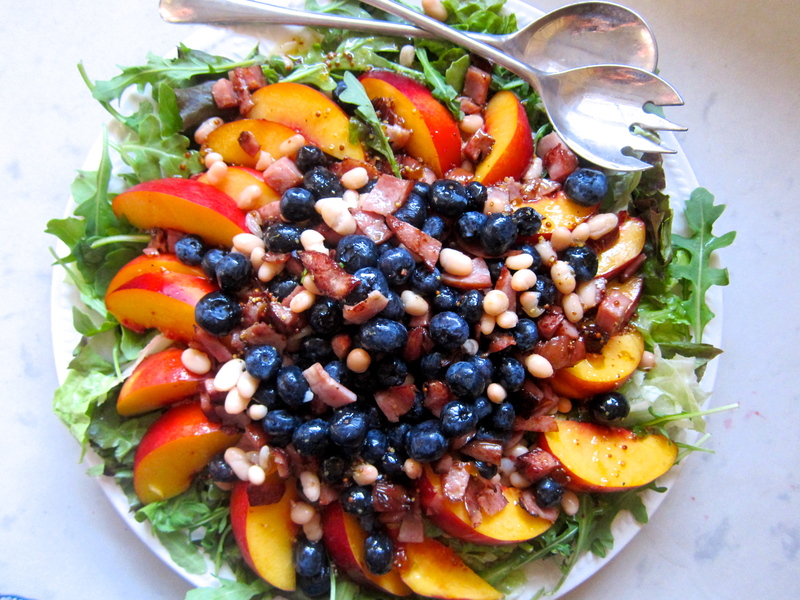 Layer the lettuce, arugula, cannellini beans, nectarines, blueberries and then the ham on a large platter. Shake together the dressing ingredients in a jar with a tight lid until it’s well blended. Pour over the salad just before you set it on the table. Light summer supper. Hope you enjoy it!